NEW RUMORS ABOUT VH TOUR 2019 ? Topics › All Forums › General › Van Halen News › NEW RUMORS ABOUT VH TOUR 2019 ? This topic has 15 voices, contains 41 replies, and was last updated by ron 9 days ago. In one of our recent posts on Facebook, A Warner/Chappell Music employee, Tomas Bmyr has revealed exciting details about Van Halen reunion tour. “Van Halen will be touring in 2019. As you know, I work at Warner, and we have, by being the label of many incredible artists, information from their management. An official announcement is coming VERY soon, but here’s what you need to know, to clarify the rumors of recent months, including this return more or less awkwardly announced by David Lee Roth. – This is not a tour itself, but 6 dates in American stadiums, during the summer to come. – The band will be going to Las Vegas for 5 additional dates, in December. – It’s not a farewell tour. – The line up is the same as the last years: Eddie, Alex, Wolfie, and David. However, to answer the rumors of reformation of the original line up, YES Michael Anthony will be of the part, but it will be only appearances with each concert, featuring, at a given moment of the concert … indeed, Mike will come on stage with his bass Jack Daniels and begin his famous bass solo, before playing “somebody get me a doctor”, which he will sing himself, as in 1998 and 2004. By cons I do not know if Wolfie will be on stage at that time …. Eddie Trunk said true. Mike too, since he is not allowed to talk about this project …. – No interview will be granted, no one wants to justify the war against anthony and hagar, and this unexpected return, it seems that this is a big financial and legal history: Last year, Van Halen wanted to celebrate the 40th anniversary of the first album, turning and re-recording the first album, but with Wolfie on bass. Anthony opposed this. 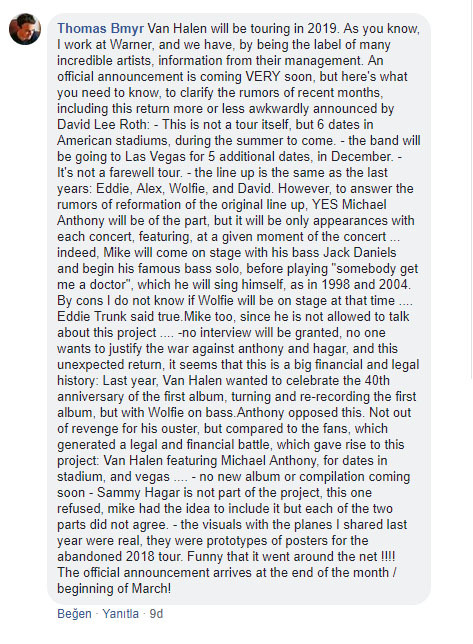 Not out of revenge for his ouster, but compared to the fans, which generated a legal and financial battle, which gave rise to this project: Van Halen featuring Michael Anthony, for dates in stadium, and vegas …. – No new album or compilation coming soon. – Sammy Hagar is not part of the project, this one refused, mike had the idea to include it but each of the two parts did not agree. – The visuals with the planes I shared last year were real, they were prototypes of posters for the abandoned 2018 tour. Funny that it went around the net! Who are they with now ? I thought Interscope was a 1 album deal only when they released ADKOT. Wasn’t the Tokyo Dome live album on Warner Bros. or some other Warner Bros. company? If this is to be believed, they’ really only going to bring Mike out for one song? PT5150: Did’nt think VH was with Warner any more… Who are they with now ? Interscope Records.. He says HE works for Warner and that “by being the label of many incredible acts”, he has “information from their Management”. Doesn’t say anything about VH being with Warner. I’m sure artist’s management share info around with others in the industry. That being said, I think bringing Mike out for ONE SONG per night will blow up in their faces. I expect to hear a lot of boos once he leaves the stage. Those of us who have been waiting for a TRUE REUNION are being screwed by 1) having to pay a FORTUNE to see them in a STADIUM and 2) getting one song with the original line up. And if they REALLY wanted to “celebrate” the first album by rerecording it with Wolfie…I’m speechless. Does this mean they were going to redo the entire album with 2018 Dave and not the original 1978 Dave as well? Is Eddie drinking again? “I am Carole GUERNALEC the legal director of Warner Chappell Music France. I work with Thomas BALMAYER. “Last year, his name and Facebook account have been hacked in order to send fake news. We obtained the closure of the Facebook account. I put zero stock in this and really wish these rumours and gossip would stop. I am just as hopeful as any of us here. But it’s not going to happen. floydrose5150: I put zero stock in this and really wish these rumours and gossip would stop. I am just as hopeful as any of us here. But it’s not going to happen. You know the rumors will never stop so long as Van Halen continues it’s current communication plan of no communication. Former VAN HALEN singer Sammy Hagar says that there has been “no confirmation” about Michael Anthony reuniting with the band for a tour. A recent rumor has suggested that the original VAN HALEN lineup — including Anthony, who has not played with the band since 2004 — will reunite in 2019 for a run of stadium shows. This would be the first time that the four founding members of the band, including singer David Lee Roth, guitarist Eddie Van Halen and drummer Alex Van Halen, perform together since 1984. Hagar, who plays with Anthony in both THE CIRCLE and CHICKENFOOT, was asked about the VAN HALEN reunion rumors during a recent interview with Meltdown of Detroit’s WRIF radio station. Music News with Al Beck covers the Korn/Alice In Chains tour, Queen and the Oscars, “The Dirt”, new music from The Offspring, Phil Anselmo news and more…..
As always, THANK YOU for listening! If you like this podcast, please give it a 5 star rating, write a review, share it with your friends. Leave a VM at 248-586-2988. AH! Man I need some tylenol for sure. No forget about tylenol. I really need Jack Daniels.